High quality information for DIY Tiny House Builders leads directly to well designed, quality built tiny houses that are comfortable year round. The consequences of using inaccurate, inappropriate or poor information in your tiny house design or building methods will adversely effect the liveability and utility of your tiny house. That’s why we love to share and pass along original, primary source documentation on topics essential to designing, building and living in a tiny house, which is what we’ve done below and what we encourage you to share with us so we can publish them as a resource here for others. We don’t engage in “affiliate relationships” or receive any kickbacks for mentions here, so you can trust what we say here as our opinion with no strings attached. Original, primary source documentation, could be a web-link to a scientific research paper, authoritative site or even a blog post of your own first hand account documenting your experience. It’s also the way when you were in school you provided citations when writing a research paper. We’re looking for verifiable facts and the original documents to read, not just your opinion. This helps all tiny house builder reading the materials know where you got your information that helped form your opinion. This allows the reader to evaluate the evidence for your opinion for themselves and maybe come to a different conclusion. Opinions are not worthless, but when they are supported by the original, primary source documentation they become a valuable resource in the evolution of designing, building and living in tiny houses. So, let’s trust facts, especially the verifiable ones and do research to find out the truth on all matters tiny. Please Contribute Your Tiny House Resources! Have you found a gold mine of great information on the internet that other tiny house DIY-ers in Australia would benefit from? What’s the standard you must meet for a THOW in Australia? First and foremost it’s a road vehicle that you are building when you build a Tiny House on Wheels (THOW). It’s understandable that we get focused upon the part of a THOW that’s a house, but it must never be forgotten, that first it’s a road vehicle, so it needs to comply with all the Australian standards, if you want to have your tiny house on wheels registered in Australia. The standard to meet is found in the VSB1 (Vehicle Standard Bulletin 1) last revised in 2009. The VSB1 is the Australia wide standard we must all meet when building a trailer, caravan or Tiny House on Wheels (THOW). The VSB1 on the Department of Infrastructure, Regional Development and Cities website. The building materials that make up a tiny house contribute in a major way to the final total weight of your tiny house. So each individual piece of wood, pane of glass or solar panel adds to the weight of your tiny house. 2.) the density of those materials. In terms of weight the first thing to do is to reduce the dimension of the materials you use. If a 70×35 piece of something will do the job, then that’s better than a 90×45 piece of something, since there will be a 40% savings in weight by using the smaller dimension material. In terms of weight the second thing to do is to reduce the density of the materials you use. If a less dense piece of something will do the job then that’s what you should us in a tiny house. So what dimension and density of material “will do the job”? That’s a great question, because reducing dimensions and densities can very well effect the strength performance of the material and the overall structure. For now in this section, we’re just focusing on the factors that will reduce your overall weight and save a discussion of strength for later. Strength is a more complex issue that has to do with how you’re using the building material; how you’re fastening them together and how the overall structure will perform moving and rattling down the road at 80-100km/hour. 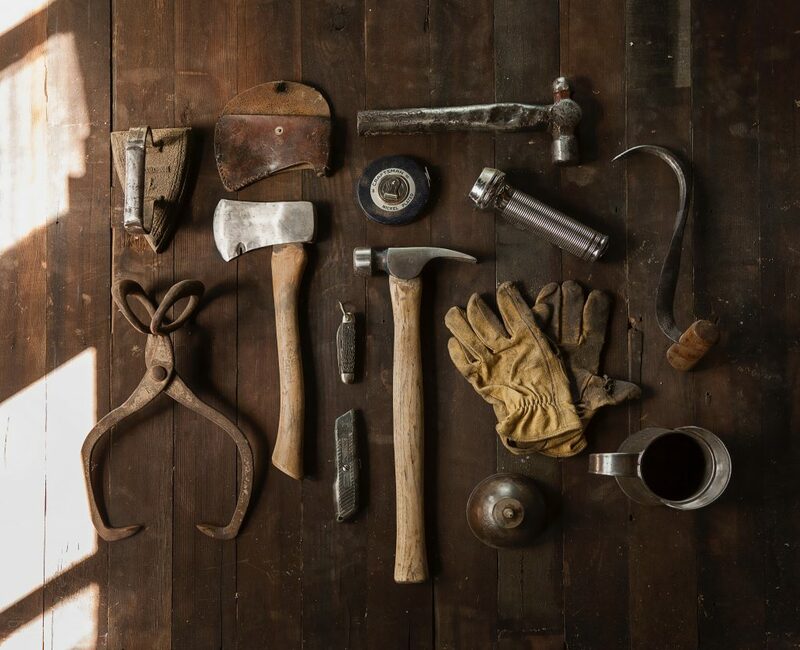 Know your Densities: Tiny House Building Materials – they all add up… and it adds up faster with high density materials. Density is defined as mass per unit volume, with the common unit of measure for density being [kg/m3], which is said, “kilograms per cubic meter”. As an example: water has a density of 1000kg/m3, which means that a meter cube of water weighs 1000kgs. That’s heavy, so not a good idea to transport water in your tiny house. Density [kg/m3] x Volume [m3] = Mass [kg] Here’s an example: How much does a one meter length of 90×45 pine timber weigh? Why do we say “mass” when we are talking about the “weight” of an object? Technically speaking in physics mass is not the same as weight even though we use them interchangeably. Weight is a force determined by gravity and mass is a property of the object. You can think of it this way, an object on the moon would weigh less than it does on earth because of the lower gravity on the moon relative to the earth. But the mass of the object would be the same on the moon as it is on earth. Wood Densities Compared It’s important for tiny house builders to know about the various densities of wood and other material to be used in their tiny house. You’ll want “seasoned” or dried wood for all the wood in your tiny house, because “unseasoned” or “green” wood is substantially more dense. Plus “unseasoned” will shrink in size and change shape as it dries out and becomes less dense. Density can vary a lot with wood. I’ve provided “seasoned” densities in the handy reference guide for Australian Building Materials Density List (pdf) below. In Australia, the lightest and least dense wood you’ll come across is, Paulownia, which comes in at only 280 kg/m3, which makes it even lighter than Western Red Cedar (WRC) a softwood species with density of 330-385 kg/m3. In comparison, Radiata Pine is a versatile, fast-growing, medium-density softwood species with an density of 400-550 kg/m3; while Tasmanian Oak or Victorian Ash is a hardwood species with a density of approximately 650kg/m3. And for a further point of comparison for tiny house builders the density of glass is 2400–2800 kg/m3. Yikes! Makes a tiny house builder think twice about double glazing! Colour temperature can make a big difference to the liveability of a tiny house. What is colour temperature, anyway? The difference between “warm white” and “cool daylight” on light globe packaging is a reference to the colour temperature of the light. You intuitively know the difference between the different colour temperatures of light. The 24 hour, all-night petrol station has very bright bluish light. An old-fashioned incandescent bulb, very yellow, even golden in colour. Cool colours are bluish white and have a colour temperature of over 5000K. The “K” stands for “degrees Kelvin” and is the unit of measure indicating the colour temperture given off by a light source. Warm colours are yellowish through to red, having a colour temperature between 2700 and 3000K. Cool colours around 4000K. A cold colour temperature 5000-6000K. 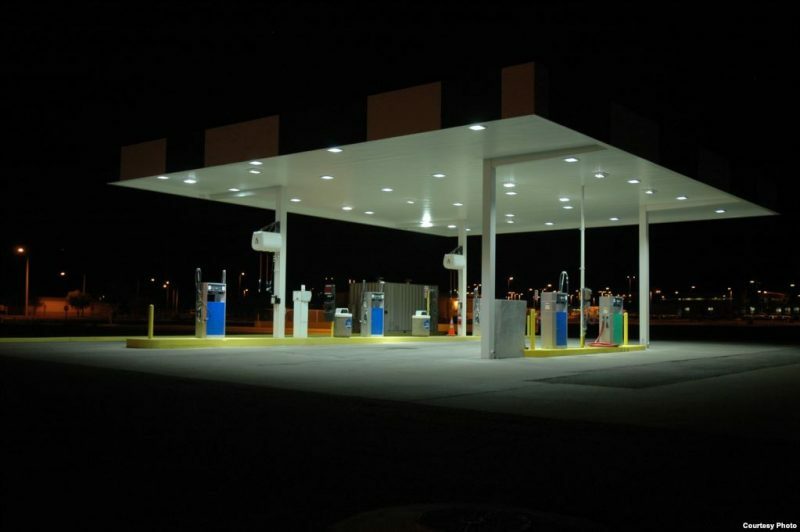 Example of the cold colour temperature of petrol station LED lighting, typically 5000-6000K. 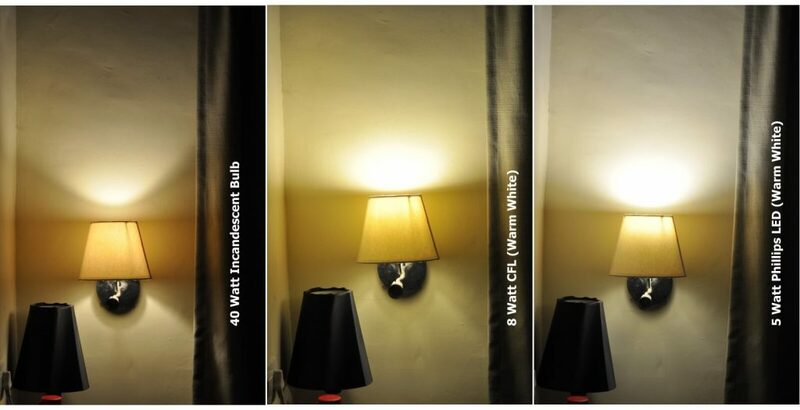 Comparison of 40W Incandescent bulb (left); 8Watt Warm White CFL (center); 5Watt LED (warm white). LED lights are very energy efficient, use less power and are essential for living off the grid in your tiny house. You can buy LED light strips on a roll and make your own fixtures which is a great way to save money while crafting the lighting in your tiny house to suit your tastes, rather than just what’s off the self. Unfortunately the colour temperature of LED lights is less likely to be that wonderful warm yellow colour and more likely to feel like the petrol station lights, so test the LED’s with your own eyes before you buy them to check their colour temperature, because you cannot always trust the colour temperature on the packaging. Another way to work with colour temperature is to bounce the light off of another surface, the colour of which you do like and it will soften the whole feel of your tiny house. 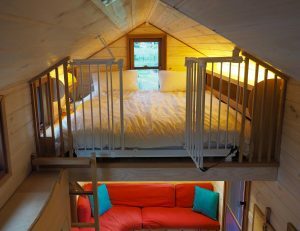 That’s what we did for the lighting the loft bed in our tiny house (below). Warm white LED light strips splash light off the ceiling to soften the lighting in the loft bedroom of a tiny house. The Humanure Handbook is perhaps the most comprehensive and thoroughly researched book on the topic of composting human manure available anywhere. It includes a review of the historical, cultural and environmental issues pertaining to “human waste,” as well as an in depth look at the potential health risks related to humanure recycling, with clear instructions on how to eliminate those dangers in order to safely convert humanure into garden soil. 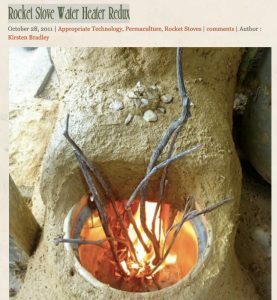 Written by a humanure composter with over thirty years experience, this classic work now includes illustrated, step-by-step instructions on how to build a “$25 humanure toilet,” a chapter on alternative graywater systems, photos of owner-built humanure toilets from around the world, and an overview of commercial composting toilets and systems. Pathogen Removal in Compost – an interesting bit from Wikipeadia. 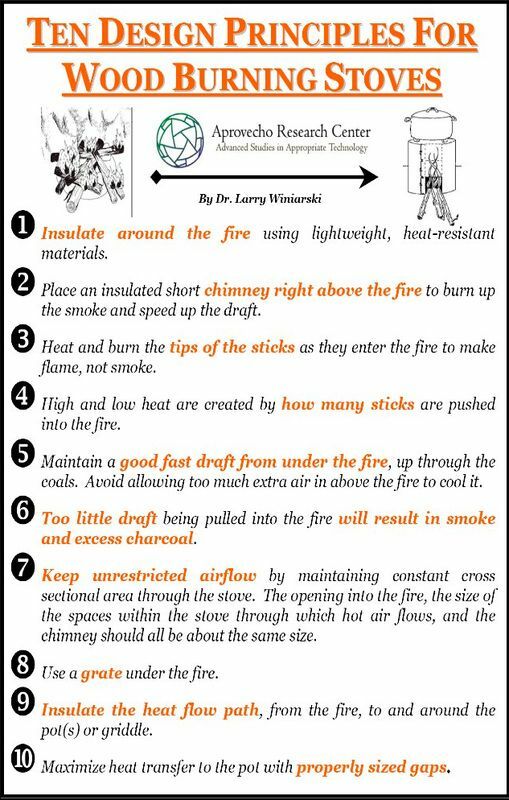 Capturing Heat Two; Fuel Efficient Cooking Stoves with Chimeys, A Pizza Oven and Simple Water Heaters: How to Design and Build them. 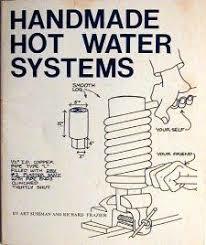 Very practical book for making Handmade hot water systems and the resource Fred used to make his off-grid passive solar hot water system. One of the Rainbow Power Company‘s (Nimbin, NSW) stated aims is: “to educate the general public in aspects of using energy from renewable sources, and living and developing in a sustainable way.” A website with lots of useful resources from fair dinkum home grown Australian experts on solar energy. Battery University™ is a free educational website offering hands-on battery information to engineers, educators, media, students and battery users alike. The tutorials evaluate the advantages and limitations of battery chemistries, advise on best battery choice and suggest ways to extend battery life. The information is compiled from specifications and independent test laboratories as well as crowd sourcing. Average readings are used when practical rather than citing research papers, as lab results are often not repeatable in real life. This differs from scientific papers published by academia and research laboratories for scientists. Battery University™ is sponsored by Cadex Electronics Inc., a technology provider specializing in the design and manufacture of advanced battery packs, BMS, chargers and diagnostic devices. This is a great article from The Conversation, that talks about Maria Saxton‘s doctoral thesis which performs an Ecological Footprint Analysis of Tiny House Downsizers. View our choice of trailers here.